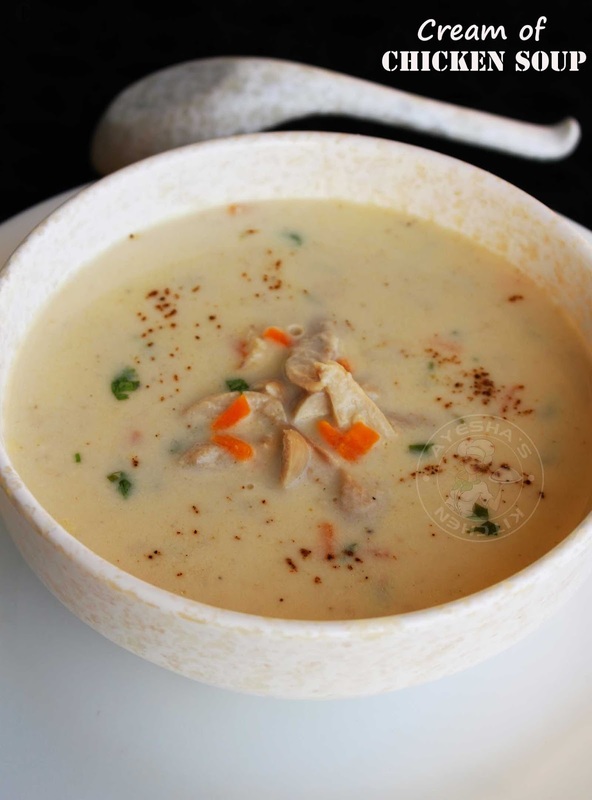 It is very healthy to make homemade soups than the store bought packet soups. We know that soups are tasty, flavorful and filling. Still some dislikes making soups at home and go for packet soups. Just spent few hours in kitchen for making stock or broth and keep refrigerated these stock or broth for making instant quick soups. 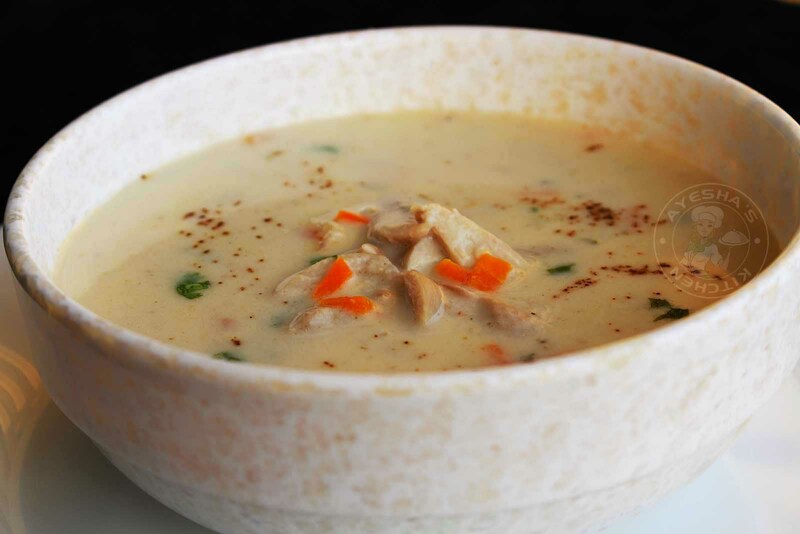 Have a look at this homemade cream of chicken soup which gives a smooth creamy finish. Popcorn, salads and soups are my daughter's favorite foods. I often make these dishes at home. This creamy chicken soup is as good for a comforting meal or dinner party starter. Do try this warming bowlful of creamy soup and enjoy your meal. 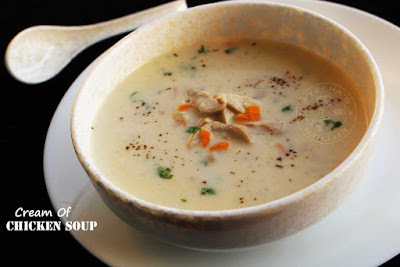 So here is the recipe showing how to make creamy chicken soup / recipe for cream of chicken soup / cream chicken soup /cream soup recipes /soup recipes with chicken /homemade chicken soup / chicken stock recipe / chicken broth recipe /making chicken bone broth /how to make bone broth. First lets make chicken stock or chicken broth. For that, boil all the ingredients given under ' for making chicken broth '. Once boiled, reduce the flame to medium low and cook for 10 minutes until chicken becomes tender. (i took meat of chicken legs and wings for this recipe. Chicken thighs are more preferred). Once done, drain the broth to a bowl. Make chicken slices and shredded chicken out of this cooked meat. Heat a nonstick wok and reduce the flame to very low (very important). Melt the butter and then add the all purpose flour (maida). Mix well until a creamy texture. To this add milk slowly, stirring continuously. Mix well without any lumps. Bring it to boil. So make the flame to medium. Stir occasionally. Once boiled, add the prepared chicken broth. Mix well and simmer for few minutes. Meanwhile take two tablespoons of shredded chicken in a blender along with one tablespoon of chicken broth. Mince the chicken or blend it into a smooth puree. Add this puree to the pan. Stir well to combine and bring it to boil on a medium flame. To this, add sliced chicken and shredded chicken along with pepper powder and salt. (add less salt in soup recipes). Then add cream and stir to mix. Top it with chopped parsley leaves and stir. Switch off the heat. Serve piping hot along with a drizzle of lemon juice and pepper powder if required.